Countryfile spin-off series unveiling the secrets of spring. Matt Baker is out at sea as he joins the RNLI for a high-octane training exercise. Keeley Donovan is in Scotland investigating how an intruder is destroying our earthworm population and the health of our gardens and allotments in the process. The New Zealand Flatworm is thought to have wormed its way into the UK in imported plants in the sixties. Since then territories have spread throughout the land, especially in Scotland, the North of England and Northern Ireland. Keeley meets Aberdeen University Scientist Annie Robinson who knows just what havoc these creepy crawlies are causing. Allotment holder Sue Callan demonstrates just how much their presence has affected her soil and produce. So how do you make sure you don’t get invaded? Keeley gets the lowdown on how to keep them at bay. Our British waterways and canals are among our most famous countryside landmarks but sadly a tsunami of rubbish is putting them at risk. Paul Martin’s rolling up his sleeves to join in a spring clean on a stretch of canal in Birmingham. He discovers how Dhruv Boruah and his extraordinary bike boat are causing quite a splash. Horrified at the haul of rubbish retrieved from the water and the canal side, Paul discovers what harm litter is doing to wildlife and potentially to humans. Margherita Taylor is at Secret World Wildlife Rescue Centre in North Somerset for the first of three special Countryfile Spring Diaries reports. Almost two thirds of the 6,000 casualties and orphans carers deal with every year are birds. An emergency has just come in – a gull with some of the most horrific injuries our wildlife rescue squad has ever seen. A lure has gone through its beak, tongue, wing and foot. Can they save it? An owl gets an eyesight check, will it be ready to fly the nest? Matt Baker takes a bumpy ride with the UK’s only full-time, paid coastal lifeboat crew at Humber Lifeboat Station. He joins Coxswain Dave Steenvoorden and his crew to find out about their exciting daily routine. 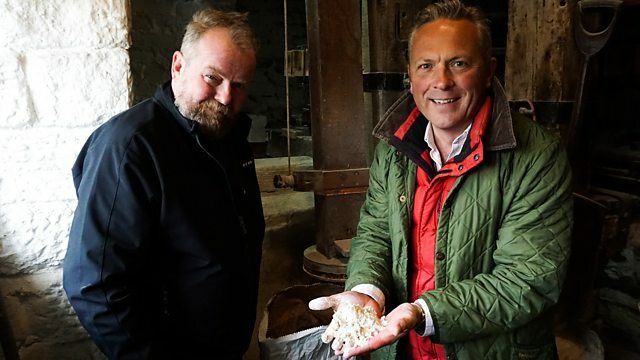 Jules Hudson is seeing if he’s got what it takes for a dream job in the countryside. He’s at 17th century Worsbrough Mill in South Yorkshire where Miller Richard Moss is retiring and the search is on to find a replacement. Milling flour is a process that has lasted hundreds of years but now the mill is busier than ever thanks to the boom in artisan bread. Bakeries could soon be overtaking coffee shops on our high streets and business has rocketed by 1500 per cent in just the last four years. As he puts his nose to the grindstone to find out about our growing love affair with posh bread, can Jules impress? And is this the perfect way to earn a daily crust?